BEWARE - These men could bankrupt you! OK, not directly, but by helping you embark on a course you may previously have managed to circumnavigate. So be warned, and don’t blame us if those of you who aren't already, get hooked to collecting David Bowie’s considerable 7" back catalogue! 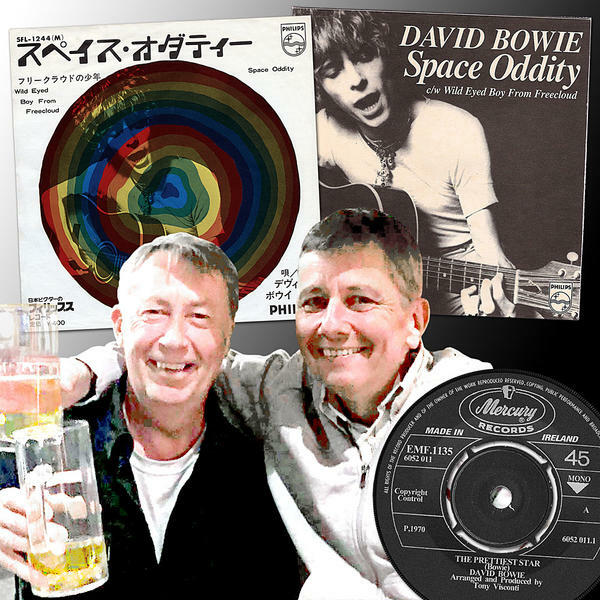 Back in April last year, we told you about the now sold out SPECIAL DELUXE EDITION of the DAVID BOWIE WORLD 7” RECORDS DISCOGRAPHY 1964 – 1981 by Marshall Jarman (left in our picture), and Reto Stöcklin (on the right). But don't fear, a softback version is now available for pre-order here. Q - What is the most expensive Bowie 7"? A - It changes, but a "Space Oddity" Japan Philips sold for the incredible sum of US $20,000 in Japan last year. Q - Do you think there is a particular area more popular among the big collectors? A - Pre-RCA stuff and the more exotic RCA Picture Sleeves from countries like Mexico, Turkey and Japan. Q - What would you say is the holy grail of Bowie 7" collectables? A - "The Prettiest Star" Ireland is exceptionally rare. Only one of the well-known collectors has a copy. Keep reading for exclusive contributions from both authors. I was never interested in sports as a kid, it was always music with me. The only radio station playing a steady stream of pop music was Radio Luxemburg and the reception was appalling. I got my first record player for my 11th birthday and watched "Ready Steady Go!" on the television for all the latest sounds. I did paper rounds, worked on the market, caddying at the golf club ... and spent the lot on records, which I bought mainly second-hand. There were things called jumble sales, there were second-hand shops, and every market in every town seemed to have a stall with second hand records. I first became aware that some people would pay way above nominal prices when 'Rolling Stone' magazine started and small ads in the back were offering far more for some records than I could buy them for. I consequently started dealing in records when I was 14 and still at school, selling mainly 60’s beat records to Americans and later on buying American records to sell here (UK). As far as I recall, I wasn't aware of all of David Bowie's early stuff until the George Tremlett book which was 1974. Record fairs and "Record Collector" magazine were still in the future so trading was mainly 'word of mouth' contacts and small ads in the music press. The biggest difference between the 70's and now is of course the prices. I bought my first "Liza Jane" for £40. By the latter half of the 70's there were a few mail order dealers with rare records in their catalogues ... and record fairs had started ... and then "Record Collector" magazine ... and record collecting boomed during the 80's. Consequently, record shops and even market stalls all purchased the "Rare Record Price Guide" and the odds of finding a bargain dwindled. Today, with the various internet sites, the world is literally at your fingertips and finding rare records couldn't be easier. I doubt that it’s anywhere near as much fun though! David Bowie’s multifaceted creativity is amazing and that is reflected in his record releases across the decades. In the book we look in particular on 7" vinyl released worldwide between 1964 (Liza Jane) and 1981 (Scary Monsters). This represents well over 1,000 different records produced worldwide in not less than 45 countries. Some will collect all issues, promotional copies and test pressings - sometimes even tiny typographic variations on the cover or labels, a never ending quest. Others will focus on a specific country, a period or look for picture sleeves only. Amongst the most beloved 7" records are early records, picture sleeves from the Sixties, Japanese pressings (of high quality and many with unique illustrations) and a few highly sought after records, such as the USA Time or Columbian Fame picture sleeves. The rarest - and thus most expensive ones - are doubtless the unique Japanese and UK (never released) picture sleeves of Space Oddity (both pictured in our montage), together with the South African picture sleeve of Love You Till Tuesday, some stunning Mexican sleeves (i.e. Sorrow or Rebel Rebel) and the Irish (pictured) and South African releases of The Prettiest Star, to name a few. Some records, although much easier to find are beloved because of the originality or beauty of their sleeves (Portugal, Turkey or Yougoslavia for example). Coloured vinyl, picture discs mispressings and unofficial records are also topics of interest. Last but not least, a hot topic are acetates (see p 8-9). These are not records per se, but direct transcriptions of recordings on metallic plates covered by a lacquer of vinyl acetate. The most valuable ones are playback acetates: those that were cut in the recording studio in a few copies only, typically used to find a record label to commercialise a new title - some containing unreleased songs. The record companies then also had their own acetates cut for internal evaluation purposes. Acetates were also used in the mastering process ("Mastering acetates") to produce master plates and stampers to press the records. For me this project is an achievement. Collecting is quite egoistic and not productive. This book allowed me some creativity. Thanks for that chaps, much appreciated. Now all we need is a better relationship with our bank managers or a lottery win!